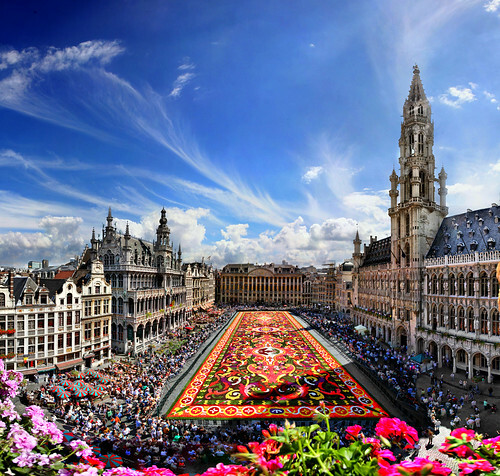 One of the most awaited cultural events of the Brussels is the famous biennial floral carpet show which takes place in August every alternate year, in the central market square, popularly known as Grand Place or Grote Markt. 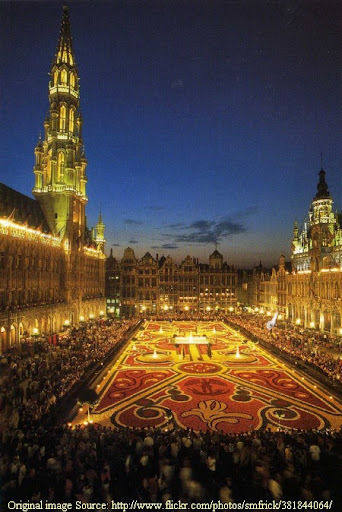 The square is the most important tourist destination and one of most famous landmark in Brussels. The art of making floral carpets is very old and is in vogue in several countries where floral carpets are generally made on some religious or social occasion. However carpets in other places are not as beautiful as the carpets created exclusively from begonias in Brussels. 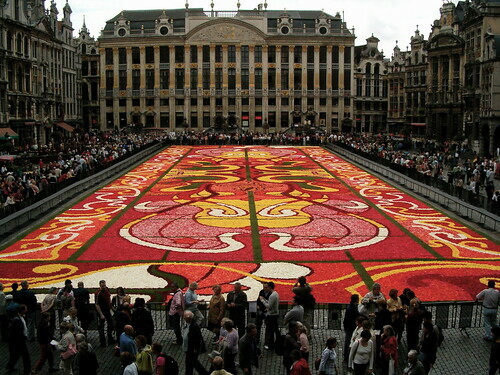 The tradition in Brussels was first started in 1971 at the Grand Place when the landscape architect E. Stautemans made first giant floral carpet. Thereafter carpets were made here in 1976, 1979, 1980, 1986 and then every second year. The floral carpet show for year 2010 was held during the Next carpet show is scheduled for weekend of 13-15 August 2010. Images and details of recently concluded 2010 floral carpet can be seen this post posted on Sept 1, 2010. About 700,000 flowers are used in the carpet making and every time a different theme is undertaken. The planning work starts a year in advance. Once the theme has been decided, the number of flowers and colour combinations are estimated and the outlines prepared. A day before start of the event the square is cordoned off and rolled grass turf is laid in the square as per pre-planned sketch to fill-in the empty spaces between the floral pattern. 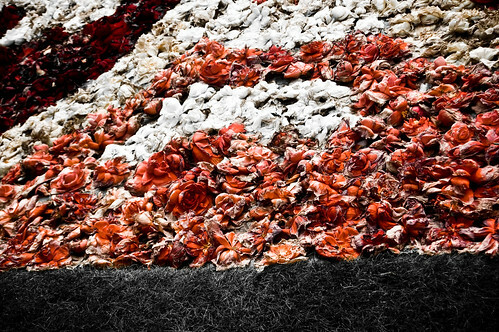 On the main day about hundred experienced gardeners take about four hours to complete the giant carpet, measuring about 77 x 24 metres, by closely packing together one by one, begonia flowers of different colours. It is arduous work and a very tight packing is made (300 flowers per square meter) so that the flowers are not blown away by the wind. The dense packing of flowers can be seen in this picture taken during the August 2008 show. The slightly raised stars were provided with a rotary motion. Images and details of recently concluded 2010 floral carpet can be seen this post. More information and themes/images of all the previous years are available at the official home page. Credits: Special thanks to Umme-Ayaan for bringing this spectacular show to my knowledge.